Thai Cuisine? You wanna tell me or should I just tell you? Evidently (Thai Chicken Green Curry, Spicy Thai Noodles & Tom Yam Chicken)? Evidently again (Tom Yum Prawn Fried Rice, Thai Green Fish Curry, Thai Fish Noodle Soup & Thai Yellow Chicken Curry)? I can go on and on, but what's the point? Don't get me wrong please. I am in no way trying to brag, but I am trying to put my thoughts across that I am quite well versed with Thai dishes. What's the Thai dish for this day? Obviously? 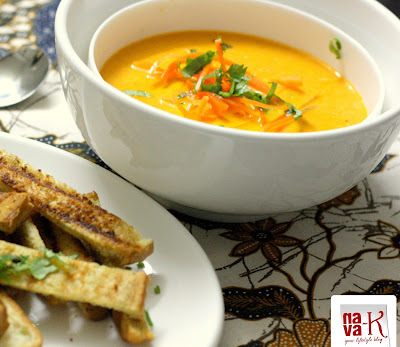 Thai Carrot Soup. Recipe pinched from an old magazine, but I, as usual, I tweeted the recipe. Mainly because, like I always tell you, let cooking begin with the ingredients we already have at home instead of? My point is why waste money when we can make do with ingredients already stored at home? Of course. How do we go about making this Thai Carrot Soup? Pretty much like most other soups (Onion Soup), though you need to make the soup paste. The dried prawns paste alongside shallots, lemongrass and of course, we need chillies for Thai dishes no matter even if its soup? By far. Or if you want to make a kid friendly version, then, forget about chillies. All in all, Thai Carrot Soup (Carrot Poriyal) is a thick, creamy and full of the quintessential Thai tastes. When oil is heated, fry paste till aromatic and oil splits. Add carrots and pour two cups of water. Simmer over low heat till carrots becomes soft and tender. Remove from heat and let it cool down a bit. Add in blender/processor and pulse for a thick smooth purée. Pour into a pot and simmer over low heat. When soup is heated through, add coconut milk, fish sauce, anchovies granules, stock and salt . Stir to combine all the ingredients and remove from heat. Garnish with spring onion and serve with grilled bread slices. I love carrot soups...tried adding some pumpkin in for a creamier taste...replaces coconut or milk to a certain extent. Gorgeous soup, Nava! 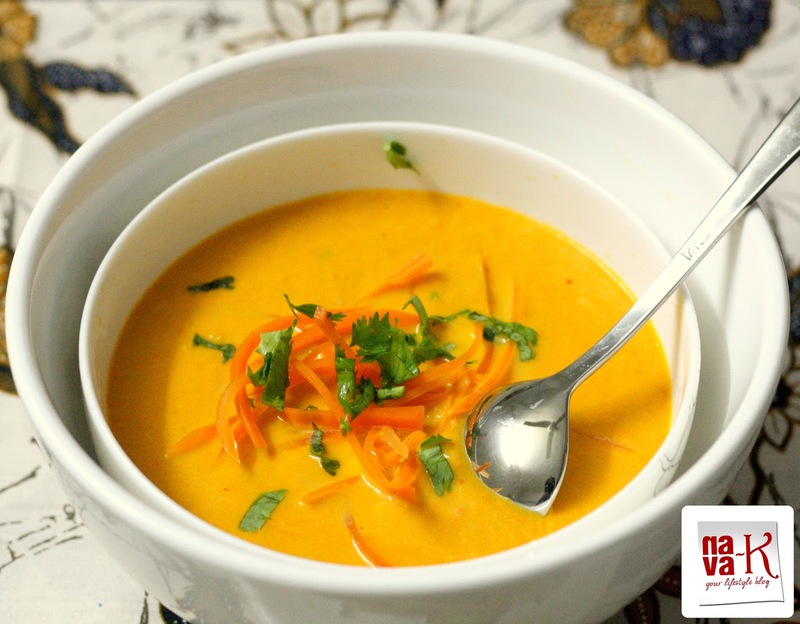 And creamy carrot sounds perfect with Thai flavors! what a vibrant, beautiful color! sounds and looks delicious. I love thai food, though I have never made at home from scratch. This is a beautiful soup, on my menu for next week. interesting. I have not tried spicy carrot soup before. what a twist to a carrot soup. 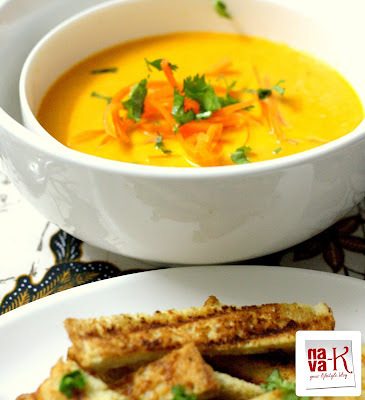 Saving your soup for later - my husband will love it!! Lovely colour and texture ! Great colours , healthy and delicious carrot soup ! !